One ticket for the September 28th, 1985 performance of Abbey Simon at Hartwick College. 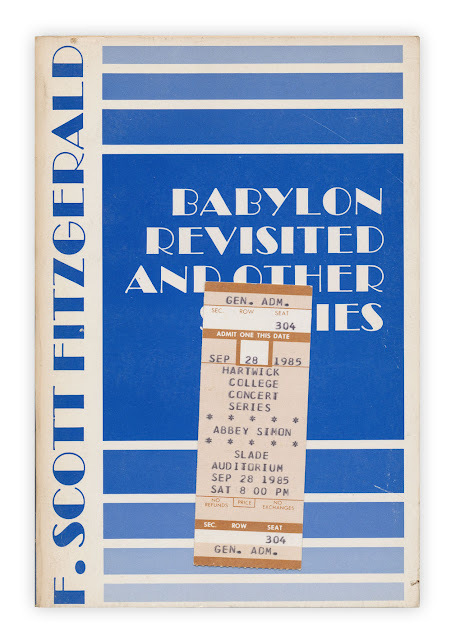 Found in "Babylon Revisted and Other Stories" by F. Scott Fitzgerald. Published by Scribners, 1971. I just absolutely love your blog. I feel like we're sitting across the kitchen table, sorting through books and sharing the things we find in them. It's that kind of warm and cozy blog space. As soon as payday comes I plan to buy your book! Thanks for taking the time to share.